Marvel’s USAvengers #1 variant covers may be celebrating the Fifty Nifty United States, but the All-American heroes can’t hold a candle to the most popular champion of the red, white, and blue: Captain Britain. 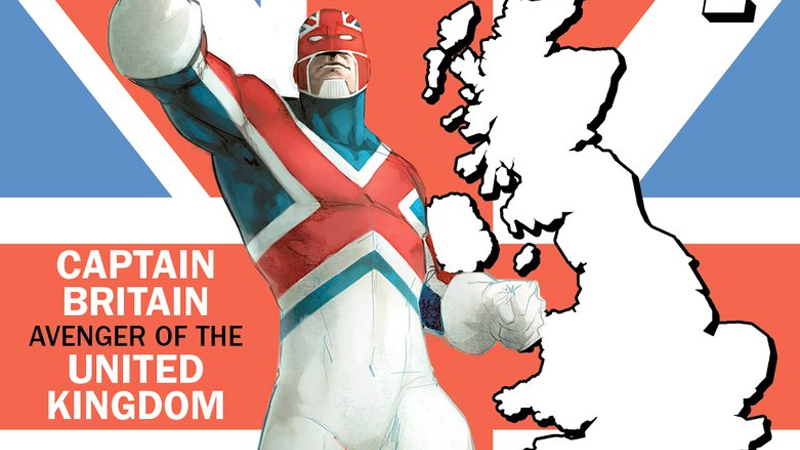 Yes, the United Kingdom is trolling the United States big time, with Captain Britain selling the most variant covers of any state in the US in pre-orders. The UK cover of Captain Britain has been leading the all-American variant cover charge since the beginning—despite being, you know, not American. In fact, I’m pretty sure the Pilgrims set sail hundreds of years ago because Captain Britain was trying to tax their buckle shoes or something. If that’s not enough, Deadpool’s Canada cover has now surpassed Texas as the second-most popular USAvengers variant cover, and Puerto Rico’s White Tiger variant is currently in fourth place. That means only two official US states are even in the top five. Though, to be fair, Deadpool and White Tiger’s covers are cooler than watching Spidey swing through New Hampshire (what?). And if that’s still not enough, based on Marvel’s handy bar graph, Captain Britain looks to be selling twice as many variants as almost every other state in the US. In that regard, Captain Britain is twice as popular as Thor, Ms. Marvel...he is bigger than Captain America, which seems really weird if you think about it for too long. Plus, the UK cover is almost doubling the sales of New York...you know, the state where almost every thing in Marvel comics ever happens. I just—I don’t even know what to do anymore, other than accept inevitable defeat and recolonization. Congratulations, Britain, you win. You can come and get your tea back.